Hiking to the Everest Base Camp is on the To-Do list of thousands of people each year. Many people make it to the EBC and some do not – numbed by the cold, gasping for breath and exhausted by the sheer exertion required to drag your body over steep, rock-strewn slopes to a bleak spot on a glacier. It doesn’t even have a view of the celebrated peak of the world’s highest mountain. I ticked EBC off my list as part of a group of seven, who started the trek nearly 200 kilometres away in the village of Jiri after a harrowing day-long trip from the chaotic Nepalese capital of Kathmandu. We were happy to start the trek after the bus ride over a rutted two-way road wide enough for one vehicle and without guard rails to prevent crashing hundreds of metres down the sheer sides of mountains. It’s all part of the risk and discomfort in trekking to the EBC so you have to ask the question: What is it about Mount Everest that draws increasing numbers of people each year? Just what is the allure? Well, first off, there is the unparalleled adventure of hiking in the grandeur of the highest mountains in the world, the stomping ground of a gentle and welcoming people whose civility and hospitality toward travelers may have no equal anywhere else. And in part, we are following in the footsteps of a modest and unassuming New Zealand beekeeper, Edmund Hillary, and his Sherpa companion, Tenzing Norgay, who climbed more than 11,500 feet higher than we did in reaching the EBC to become the first to conquer the peak of Everest. Their strength, endurance and inspiration remain strong and with us today. “You don’t have to be a fantastic hero to do certain things – to compete. You can just be an ordinary chap, sufficiently motivated,” Hillary says in a quote ascribed to him. So here we are in Jiri, a bunch of regular guys, mostly retired with three porters and a guide, and my son, a sturdy dude of 24 shouldering his own pack, who seem to fit Hillary’s definition. We are basically ordinary guys with sufficient motivation. Some of us have hiked in the Arctic, taken kayak trips on Lake Superior and the Gulf of St. Lawrence, and cycled crazy highways in Ontario and Quebec. And three of us have previous experience in the Himalayas, having trekked the Annapurna circuit five years earlier. Much has changed since we were last in Nepal. The civil war has ended and the country is reaping a peace dividend. My friend Ned Ellis, a retired federal government economist, says people appear to be more prosperous than the last time we were in country. One thing is for sure: they all have cell phones and they chatter constantly as the go up and down the mountain trails. The numbers would appear to bear out Ellis. Tourism is the country’s biggest foreign currency earner and visitors are flocking to the mountains. During the busy month of October, 2011, Sagarmatha Park, where Mount Everest is located, recorded 10,450 visitors, an increase of nearly 2,000 over the same month in the previous year. What draws them is the chance to see and walk in spectacular vistas of lush green valleys contrasted with snow-capped peaks – Nepal has eight of the 10 highest mountains in the world – that dazzle in the sun and glow in the light of the moon. It’s an opportunity to walk far back in time when the wheel did not exist, where people live off the fertile land around their modest stone dwellings. Depending on the altitude, they grow rice, corn, cabbages, bok choi, carrots, lentils, soybeans and potatoes and they pick bananas and apples. Always on offer are fresh eggs. That’s what we eat – a very basic vegetarian diet. Many of the crops are grown in small terraced fields that ripple down the sides of the steep valleys to the rivers raging below, swollen by monsoon rains and melting glaciers. Farmers till the soil with plows pulled by a couple of yaks, dig up potatoes with hand tools and make patties of yak dung by hand to fuel fires. For supper at the little Shobha Lodge in Bandhar where we spend our second night, the national dish of dal bhat is served. It consists of rice, lentil soup and curried vegetables – all you can eat. It’s also the place where we eat the first of many slices of apple pie – a fritter in this case. “My daughter is cooking,” says the proud mama of Sonita who has attracted everybody’s attention with her charm, beauty and culinary skills. She also keeps the books and in the morning we settle our bills with her. Sonita is a teacher and explains that classes start at 10 a.m. to give students who live up to two and a half hours away time to walk to the school in Bandhar. Walking is a way of life because there are no roads in the middle hills where we start out and in the mountains where we are headed. We have caught the tail end of the annual monsoon and the trails are muddy because of the rainfall. We slip and slide while Nepalis, who learn to walk on the paths as toddlers, skip gracefully past us, often wearing only flip flops. All goods moving up and down the trails have to be carried by people or pack animals, often the former. We see porters struggling under loads of plywood and mattresses for new lodges, metal stoves, containers of kerosene for the fires that cook meals at higher altitudes, bags of rice, kitchen pots and even a generator at one point. We see one bicycle (being carried because riding is not allowed in Sagarmatha Park), no scooters, no cars or trucks, no sign of a wheel and no sign of obesity. In our first nine days of trekking, we cross three valleys and climb a total of 29,000 feet or 8,839 metres, almost equivalent to the height of Mount Everest. And that brings us to Namche Bazaar at 11,319 feet or 3,459 metres where the many hotels are bursting with travelers, restaurants are dispensing espressos and a couple of bars feature loud rock music and pool tables which were humped up on somebody’s back. Most of the people in Namche, built on the side of a steep bowl, flew into Lukla, which is perched on the edge of a cliff along with its runway, from Kathmandu. We do a day hike like most people to acclimatize to the altitude. We touch base with several people we have met along the way and make friends with three young British women, recent graduates of Leeds Memorial University. Two are physiotherapists and one is a speech therapist. They are doing the trek after spending three months volunteering at a school near Kathmandu for children with cerebral palsy, a disease which affects mental and physical development. It’s not a good condition in a part of the world where a strong back ranks high on a CV. They stay with us every step of the way and their good humour buoys our spirit as we trudge up the slopes, moving ever closer to the EBC. And there are enchanting surprises along the way with Tengboche being one of them. We attend a monastery service with monks clad in their maroon robes as they murmur their mantras punctuated by the clash of cymbals and off-key blasts from horns. Surrounding the village at over 12,000 feet are snow-capped peaks including Everest and Ama Dablam, almost blinding in the sun during the day. Two of the five hotels are said to be owned by the monks as is the bakery, which tempts us with fresh coffee and has us dithering over a choice among the many chocolate cakes, pies and other baked goods. I opt for a piece of chocolate rum cake after dinner and return at breakfast for Dutch apple pie. 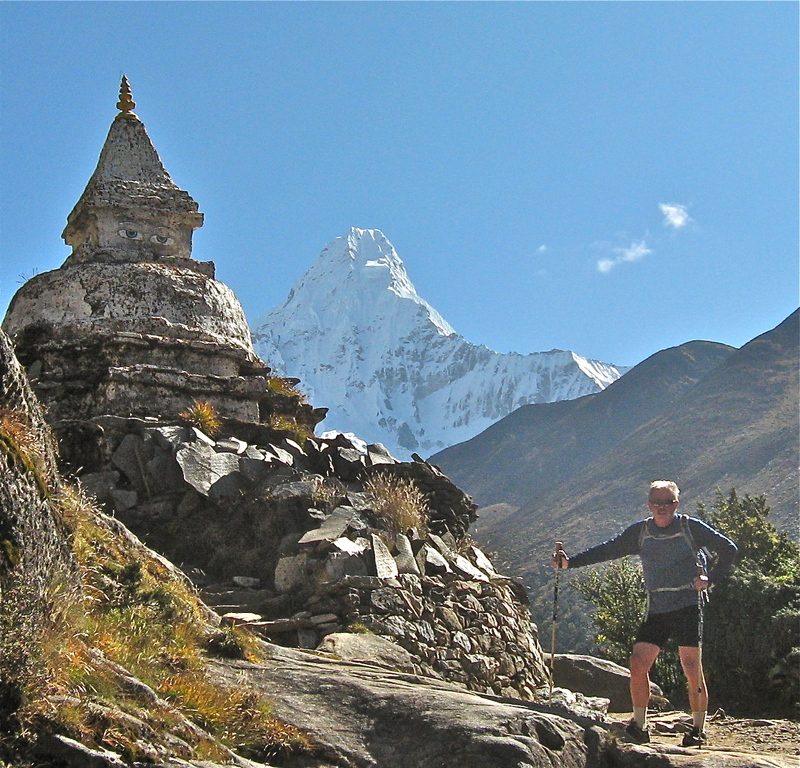 Ned Ellis pauses before moving past a Buddhist shrine near Ama Dablam. The 1,000-foot climb from Thukla to Lobuche at 16,207 feet or 4,940 metres nearly does me in and I consider throwing in the towel – a day away from the EBC. But a shower – in actual fact, a bucket of hot water scooped with a cup – and an altitude sickness pill provided by my friend Bob Johnston help give me the strength to go on. The next day we trudge into the EBC at 17,598 feet or 5,364 metres, shake hands with our group and hug the British girls. It’s mission accomplished. Then we head down the mountain and I celebrate my 69th birthday at the Snow Land Hotel in Pheriche, with a chocolate cake. Every one in the dining room sings happy birthday including a group of Taiwanese who are camping beside the hotel and a family of five from New Zealand. The family, on their way to the EBC, includes two young boys, mother, father and grandmother, who is 77. Hillary and everybody else in New Zealand might call that ordinary, but I call that extraordinary. I have often thought about the doing the climb to the base camp but as yet it is just a thought. I am glad you mention Hillary in your post as I am a Kiwi and therefore proud of one of our most famous citizens. That was quite an achievement sir and I look forward to reading the ongoing story. It has always been a dream of mine since I was a little girl to go to Everest base Camp. Your story has further inspired me to make my dream come true. A great story and awesome pictures that fuels my desire to explore the Himalayas! As we all know that Nepal is one of the finest destination that should be listed in all of the trek lover bucket list.Also the plus point is that the world’s highes mountain also lies here in this country,Nepal which is worldwide popular.As I went through your content,there was a day I also enormously wanted to go for EBC trek but sadly I haven’t yet.But I already marked the date that I’m going for.So,was searching some good about EBC at Google and found your site.And It was worth reading it.Thanks for sharing it.